TAO GROUP BLOG TAO NIGHTCLUB LAVO NIGHTCLUB TAO BEACH LAS VEGAS: PEREZ HILTON BIRTHDAY TWEETUP! 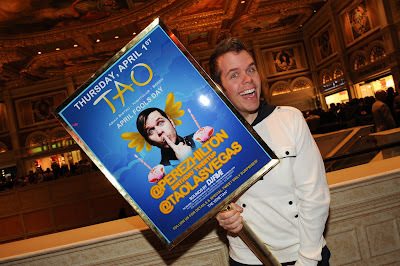 Gossip blogger Perez Hilton celebrated his 32nd birthday at TAO’s Worship Thursday. After hamming it up on the red carpet, the Queen of all Media dined with friends under the watchful eye of TAO’s famed Buddha. 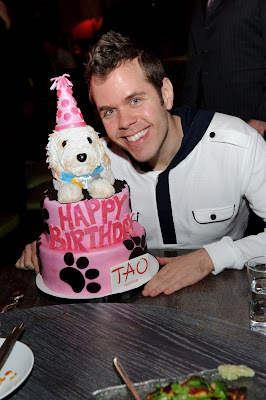 After feasting on favorites from the TAO kitchen, Perez was surprised with a custom cake modeled after his dog Teddy. Headliner Matt Goss stopped by with Robin Antin to help Perez blow out the candles before the group headed up to the Moat skybox in the club to continue the celebration. Up in the nightclub the party grew, as Holly Madison arrived with Good Charlotte rocker Benji Madden, best friend Laura Croft as well as Peepshow co-star Josh Strickland. Cacee Cobb, who can currently be seen with Jessica Simpson in VH1’s Price of Beauty, arrived with boyfriend, Scrubs star Donald Faison and joined the celebration with a table next to the birthday boy. Everyone mingled and sipped champagne, with some of the crew donning special Vegas Vixen t-shirts Holly brought along. The pink cake made a second appearance as revelers in the packed club joined in to wish Perez a happy birthday.